"We've got some good players in the side, and with the work ethic we've had this year I think we're starting to see the results on the pitch. We're getting there, and we have today," he said after England crushed Australia by seven wickets in the grand finale at Kensington Oval here. 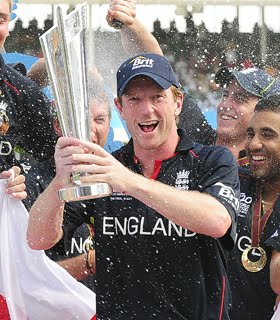 Collingwood, who was a member of the 2005 Ashes-winning squad, said his side thought they had a chance to lift the trophy after they reduced Australia to eight for three in the third over after he inserted Michael Clarke's men. "When you want to be the best you've got to beat the best. When we got them three wickets down early doors, we gave ourselves a great opportunity. We want to kick on from this.